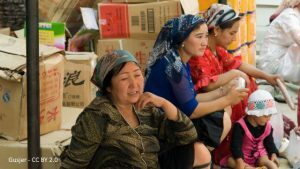 Associated Press reports that, since last spring, Chinese authorities in the region of Xinjiang have imprisoned large numbers of Muslim Chinese in mass internment camps, where detainees are made to disavow their Islamic beliefs, criticize themselves and their loved ones and give thanks to the ruling Communist Party. Those who most vigorously do so are rewarded, and those who refuse to do what they are told are punished with solitary confinement, beatings, and food deprivation. The US State Department estimated those being held were in the camps “at the very least in the tens of thousands.” A Turkey-based TV station run by Xinjiang exiles said almost 900,000 were detained, citing leaked government documents. Chinese officials have largely avoided commenting on the camps, but some are quoted in state media as saying ideological changes are needed to fight separatism and Islamic extremism. Asked to comment on the camps, China’s foreign ministry said it “had not heard” of the situation. China’s top prosecutor, Zhang Jun, urged Xinjiang’s authorities this month to extensively expand what the government calls “transformation through education” in an “all-out effort” to fight extremism.